Sequel to the online multiplayer hit Battlefield 1942. This one expands on the gameplay and takes us into the modern warfare arena. Most of the game is set in the Middle East, with a few levels being set in China. Like BF1942, this is a team game with as many as 64 players in two teams on a large map. The goal is to capture and hold bases (or flags). If you hold more of the flags than the other team, their score goes down. 1st team to zero looses. They call this game mode conquest. In order to accomplish your goal you can play as a variety of character classes, from medic to sniper. 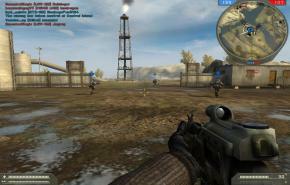 I tend to prefer the special forces class mainly because they have a good rifle and can take out tanks with C4 packs. There are also a large selection of vehicles to drive or pilot in the game. Everything from tanks to attack choppers. The maps are so large that it is really difficult to get around without a vehicle. BF2 adds the ability for you to group up into squads. Once in a squad you can spawn wherever your squad commander is. You can also quickly see your squad members on the radar. Squad commanders can also issue orders to the squad via a simple interface. The squad commander can also be issued orders from the team commander. Speaking of the team commander, that is the other new feature of the game. Each team can have a commander that can issue orders to squads, drop supply crates, and bomb an area via artillery. The commander has a map interface similar to what you'd see in a Real Time Strategy (RTS) game. There is so much to see and do in this game. I can't recommend it enough.